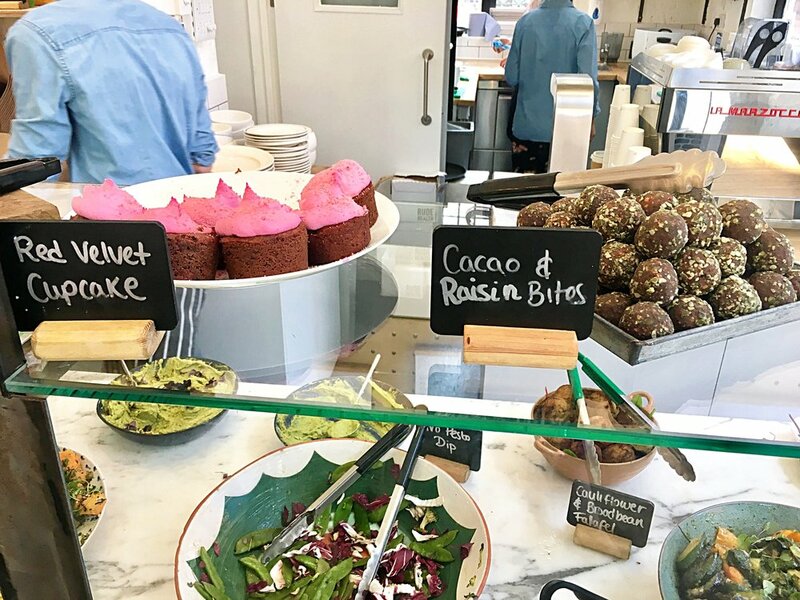 I've been following Ella Mills (@DeliciouslyElla) for a while now, and was super excited when she opened The MaE Deli (now called Deliciously Ella) along with her husband, Matthew. Now with multiple locations around London, the delis offer natural, seasonal, and delicious food. While I (luckily) don't have any allergies or need to avoid any specific ingredients, all the food at The MaE Deli is free from wheat, dairy, additives, and refined sugar, making it the perfect, healthy spot for breakfast or lunch for just about anyone. On a recent trip to London, I visited twice, and loved all the fresh, colorful options to choose from. I created my own "MaE Bowl", with miso broccolini salad, sweet potato with coriander tahini, cauliflower & broad bean falafel, and grilled vegetables with sorrel pesto, all topped with avocado pesto dip! Talk about a mouthful, but this is my favorite kind of lunch. Veggie-based, full of flavor, and super healthy and satisfying! You know me- I rarely pass on the sweets, and this occasion was no different. The fudgy brownie tastes sinful and indulgent, but is far from it. I love when a dessert still tastes rich and decadent, but isn't full of a bunch of processed crap! Win-win! And how pretty is the hot pink frosting on that red velvet cupcake?! You can now also buy Ella's energy balls in various stores around London (like Whole Foods!). These bite-sized treats, made from nuts and fruits, are great, quick sources of energy and protein, and delicious to boot! I like keeping a few in my bag for whenever I start to get hangry. Here's hoping a NYC location opens soon!